Davos 2018: 7 female co-chairs, 70+ heads of state, 400+ sessions and a lot of snow. That's it for another year. With over 400 sessions on the official programme (160 of which were broadcast live on our website), it can be hard keeping up with everything happening at our Annual Meeting in Davos, Switzerland. To help you get your head round it all, here's a recap of some (but by no means all) of the week's big stories. On day one of Davos, Indian Prime Minister Narendra Modi listed his three most significant challenges to civilization as we know it: climate change, terrorism and the backlash against globalization. Modi, leader of the fastest growing major economy in the world - as well as the world’s largest democracy - also spoke about the opportunities and dangers of technology, India’s plan to fight income inequality, job creation, and how the country is “cutting the red tape and rolling out the red carpet” to international trade and investment. Addressing the pushback against globalization in some countries and parts of the world, Modi said: “Many societies and countries are becoming more and more focused on themselves. It feels like the opposite of globalization is happening. The negative impact of this kind of mind-set and wrong priorities cannot be considered less dangerous than climate change or terrorism. The Co-Chairs of Davos discussed the theme of this year's meeting in Davos - Creating a Shared Future in a Fractured World. It's the first time that the Forum's Annual Meeting has featured an all-female panel of co-chairs, something that wasn't lost on IMF Managing Director Christine Lagarde. Norwegian PM Erna Solberg called for a focus on corruption and illegal money flows and asked for action on gender equality. Education is the first step, she said, making sure that girls take a full part in education. Chetna Sinha, Founder and Chair of the Mann Deshi Foundation called for financial access for everyone. She announced an alternative investment fund for female entrepreneurs, worth 100 million rupees. IBM's Ginni Rometty said she wants to see greater transparency in technology, a set of principles for data and workers prepared for the future of work. Christine Lagarde, meanwhile, said we're economically in a sweetspot and this allows us to focus on shared responsibilities. We have to turn the anger we have seen into action, she added. "Even without testosterone, we can produce positive, constructive energy," she said. Isabelle Kocher, meanwhile, expressed her desire to reconcile economic growth and development with social good. CERN Director General Fabiola Gianotti said the passion for knowledge and learning is a shared passion for all of humanity. Scientific knowledge has no passport, no gender and no political party. The world needs to renegotiate a new social contract, and re-write the rules, said ITUC General-Secretary Sharan Burrow. We built this fractured world, now we need to learn some lessons and rebuild. "America First does not mean America alone," US President Donald Trump said in his speech. The state of the US economy featured highly in the President's speech. "After years of stagnation, the United States is once again experiencing strong economic growth, he said. "The stock market is smashing one record after another, and has added more than $7 trillion in new wealth since my election. "The world is witnessing the resurgence of a strong and prosperous America... America is open for business." Trump also spoke in depth about recent reforms to the US tax code, jobs, security, immigration, and why "America First does not mean America alone." "I will always put America First. Just like the leaders of other countries should put their countries first," he said. "When the United States grows, so does the world. American prosperity has created countless jobs around the globe and the drive for excellence, creativity and innovation in the United States has led to important discoveries that help people everywhere live more prosperous and healthier lives." Here's the full text of Donald Trump's speech to Davos. Alibaba founder and Executive Chairman Jack Ma spoke openly and at length about some of the key challenges facing the world, delivering a stream of unique perspectives and guidance. You can read our favourite ones here. Ma has previous form in offering leadership advice, and this year he didn't disappoint, offering a success secret to beat the age of automation. “If you don't want to lose quickly you will need a high IQ, and if you want to be respected you need high LQ: the IQ of love," he said. "Artificial intelligence, big data is a threat to human beings. I think AI should support human beings. Technology should always do something that enables people, not disable people." The computer will always be smarter than you are; they never forget, they never get angry. But computers can never be as wise a man. The AI and robots are going to kill a lot of jobs, because in the future it'll be done by machines. Service industries offer hope - but they must be done uniquely." 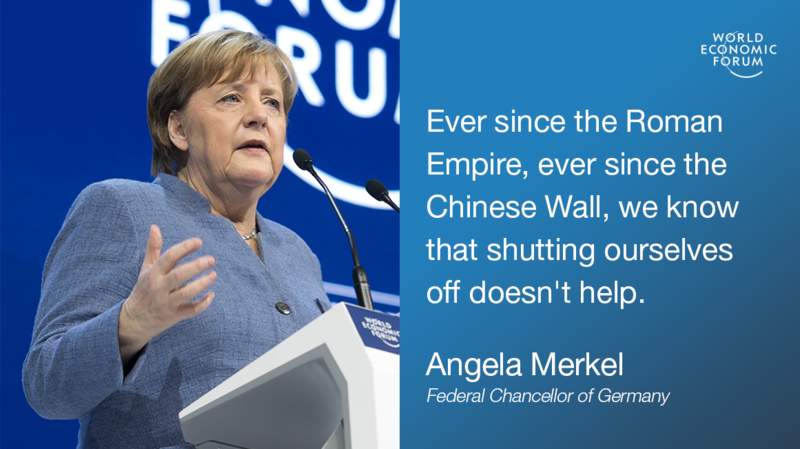 Angela Merkel invoked the lessons of history when she took to the Davos stage. Multilateralism is under threat, announced the German chancellor, reminding participants that 2018 marks the end of the First World War. "Have we actually learned the lessons of history? We haven’t really," she said. Today’s challenges can only be solved by collaboration and openness, not by building walls, she went on. "We think that shutting ourselves off, isolating ourselves, will not lead us into a good future. Protectionism is not the answer." You can read more about her speech here. "France is back," said President Macron during his speech. In a wide-ranging address that covered everything from climate change to tax cuts, one message took precedence: "France is back at the core of Europe". Echoing parts of Angela Merkel's speech earlier in the day, in which she highlighted the need for international cooperation, the French president said there would never be "any French success without a European success". Then went on to call on the wider global community to tackle the inequalities brought into play by global capitalism. Here's some more highlights from his address. UK Prime Minister Theresa May told Davos attendees that the United Kingdom was doubling down on the principles that make global trade work for everyone. As the UK leaves the European Union, it will still be an advocate of global trade, making new bilateral deals with countries across the world, said the PM. You can read May's speech in full here. Calling out abuses of power, promoting women, pushing for social change ... This session took an unflinching look at how to fight abuses of power and sexual harassment. Microsoft's Peggy Johnson talked about the amount of time women waste avoiding sexual confrontations with male colleagues and seniors. She said: "When #MeToo came out, my friends said it should be called #WhoHasn't?" I'm in a position of power now, she added, and no longer laughs at sexist jokes. With more women in power, things are beginning to change. Oxfam's Winnie Byanyima, meanwhile, said that in post-apartheid South Africa, you won't find one person who says they believed in racial oppression. So what happened? "Power," she says. "It changed." "Today, I am pleased to announce that Canada and the 10 other remaining members of the Trans-Pacific Partnership concluded discussions in Tokyo, Japan, on a new Comprehensive and Progressive Agreement for Trans-Pacific Partnership (CPTPP)," he said. Trade loomed large in Trudeau's speech, with NAFTA talks underway in Montreal this week and Trudeau in Davos partly to draw attention to Canadian investment opportunities. The prime minister has traditionally taken a relaxed stance on global trade negotiations, calling NAFTA a vastly complex set of talks with many phases, the eventual outcome of which he expected to be a “win-win-win” for Canada, Mexico and the US. Today, Trudeau said: "We're working very hard to show our neighbour to the south just how good NAFTA is." The Prime Minister then moved on to the topic of gender equality, saying that current efforts don't go far enough. "Paying a female employee the same as a male employee doesn’t even begin to touch issues around family planning, promotions, or job security. Women do more part-time work, and more unpaid work, than men. How do we address that?" He also had this to say about sexual harassment. "The people in this room are immensely privileged – we owe it to society to use this privilege for good. We should ask ourselves – do we want to live in a world where the wealthy hide in their gated enclaves, while those around them struggle?" Or do we want to help create a world grounded in the notion of fairness?" The education of young men on the subject of women’s rights is a crucial step to ending gender inequality, Malala Yousafzai said during her session. 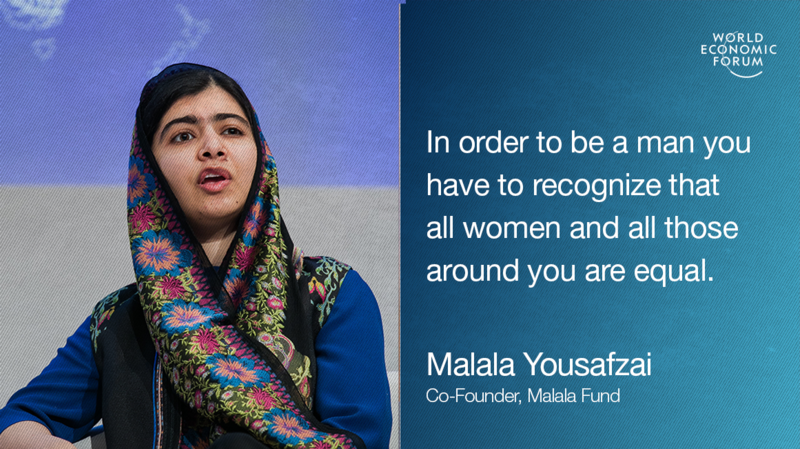 “I can’t send all girls to school, that would be impossible,” Malala went on to say. Educating girls is a collective responsibility, and we all must realize that we have a role to play, including world leaders. The International Monetary Fund raised its global growth forecasts for 2018 and 2019 to 3.9%, expecting the global economy to continue to recover on the back of buoyant trade and investment, as well as recent US tax reforms. Christine Lagarde, the IMF’s Managing Director, presented the brighter outlook during one of the week's early sessions. The new estimates are 0.2 percentage point higher than the IMF’s last projections in the autumn. About half of the global revision was attributed to the impact of the US tax package, which is expected to boost growth in the United States through 2020, and have a positive knock-on effect on its trading partners. India remains the world’s fastest-growing economy in 2018, with a projected growth rate of 7.4%. Will there be a trade war? Donald Trump's decision to impose tariffs on imported washing machines and solar panels caused some alarm in Davos this week, especially in respect to China's trading interests with the US. Asked if he wasn't concerned the move would prompt a trade war, US Secretary of Commerce Wilbur Ross said: "There have always been trade wars. The difference now is US troops are now coming to the ramparts." Not everyone was feeling so combative. In a separate interview, Jack Ma, head of the Chinese online retail giant Alibaba, made a strongly worded plea not to use trade as a weapon. “It’s so easy to launch a trade war. But it’s so difficult to stop the disaster of this war." He said he was scared and concerned, and added: "When you sanction the other country, you sanction small businesses, young people; and they will be killed, just like when you bomb somewhere." "If trade stops, war starts," he said. Actor Cate Blanchett talked about her work as a Goodwill Ambassador for the UNHCR to raise awareness of the refugee crisis, for which she picked up a Crystal Award. Travelling around the world for her work has shown her how global the problem is - and that multistakeholder solutions are needed, she said. A major part of the problem is the misinformation around refugees, who are vilified in the media. 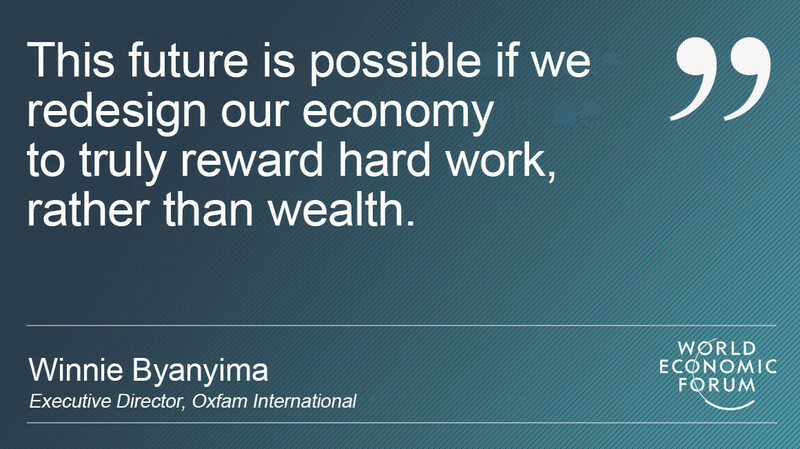 The developing world is shouldering the burden, she explained. But the developed world is being told that refugees, who have masses to offer, will be a burden. "You have to remember that these are innocent people," she says. The vast majority of them want to go home, but in the meantime, they want to offer something to their host country. But, the numbers are so overwhelming that you need individual stories. In one particularly emotional moment, Blanchett told the story of one refugee family who had been forced to flee their home in Syria because of the country's long civil war. In a one-on-one interview, Google chief Sundar Pichai repeated a line he first delivered at an MSNBC event last week, that artificial intelligence is more important to humanity than fire or electricity. He said that despite concerns about AI, the potential benefits couldn’t be ignored. "The risks are substantial, but the way you solve it is by looking ahead, thinking about it, thinking about AI safety from day one, and to be transparent and open about how we pursue it," he said. Jay Inslee, US Governor of Washington, said President Donald Trump is isolating himself on the issue of climate change. The governor said that since Trump announced he would pull the US out of the Paris Agreement, not a single nation, state or city has followed him. "There's only one man in this parade," said Inslee. He says three Republican states have joined their alliance for climate action, which now represents 40% of the US. Eighty two percent of the wealth generated last year went to the richest 1% of the global population, while the 3.7 billion people who make up the poorest half of the world saw no increase in their wealth, according to an Oxfam report. Oxfam's Executive Director, Winnie Byanyima, goes into more detail about the report's findings in this article. Last year in Davos, Chinese president Xi Jinping caused a stir by defending globalization. This year, his right-hand man Liu He took to the stage to outline how China plans to shape the world economy. He said China had tried to open its financial markets over the past year, and spread globalization through its Belt and Road Initiative. China faces three critical battles over the coming three years, Liu He went on: preventing major financial risks, alleviating poverty and reducing pollution. China will be the big financial story of tomorrow, said Jin Keyu, Professor of Economics at LSE. "It's the first time a county with only 25% of the GDP of the US is leading in many areas of tech. As we encourage China to open up, are we prepared for the shocks and volatility that even a tiny tremor in China could cause?" The Inclusive Development Index 2018 was published just as the meeting got started. The metrics used in the report go beyond GDP to look at living standards, and how effectively nations are future-proofing their economies. The conclusion? Small European countries excel, while the rest of the world has work to do. While we are on the subject of inclusion, it featured highly in the speech by the President of Argentina, Mauricio Macri. The Latin American country will assume the G20 presidency in 2018, and Macri's primary goal will be to reduce poverty. For more stories and Davos moments, why not head to our four-day liveblog. You can also watch the televised sessions here.